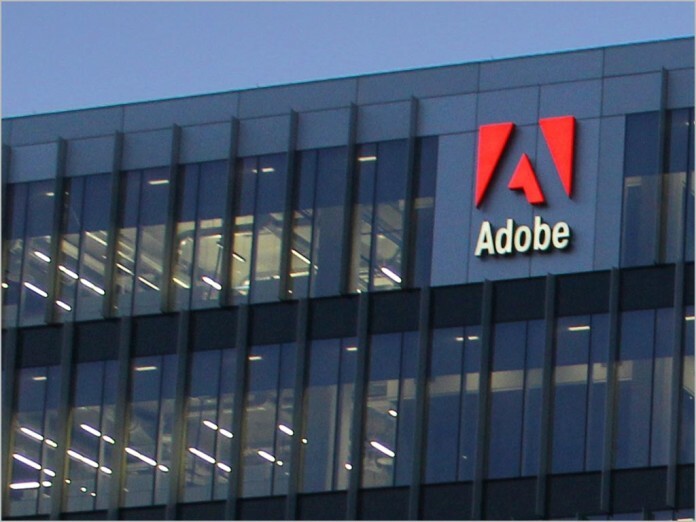 news Software giant Adobe has informed its users of its intention to substantially increase the price of accessing its Creative Cloud family of image and video editing products, in a move which appears set to cause frustration amongst the company’s already tetchy local user base. The software giant sent local customers an email yesterday stating that it hoped they were enjoying their subscription to the “world-class products and services” it provided them with, which, it said, allowed customers to do “their best work”. It appears that the email was first reported by iTnews. In the email, Adobe noted that it monitored currency exchange rates in order to make adjustments to its pricing — “up or down” as needed. Delimiter has seen a clutch of different emails to different customers notifying them of the price increase. One email notified a customer that the prie of their Adobe Premier Pro Creative Cloud subscription would rise to AU$22.99 per month, while another was told that the price of the whole Creative Cloud suite would be A$57.99 per month. One customer on the Creative Cloud Photography plan was told their new rate would be A$11.99 per month, while a customer on the Creative Cloud for Education plan was told their new rate would be A$28.99 per month. In general, the prices appear to represent price increases of more than 10 percent — representing a substantial markup from the current subscription plans customers were on. All customers were told that their subscription price would not be impacted during their current subscription term. “However, at the time of your renewal… it will increase to reflect the price adjustment for currency exchange rates … We’ll be sure to send you a reminder email as your renewal date gets closer,” wrote Adobe. It appears that Adobe is also increasing prices in a range of other countries, including New Zealand, India, Norway, Turkey and Brazil. To what extent can these price rises be justified? Well, on the one hand, it is true that the value of the Australian dollar has gone down relative to the US dollar recently. I buy quite a few services online in US dollas (Pagely, Mailchimp, Buffer, and so on) and I’m paying a lot more in Australian dollars than I would like to be for these services. However, at the same time, I absolutely would not put it past Adobe to skim some off the top. The company has a huge history of unjustified price markups in Australia which I’ve be chronicling on Delimiter since 2010. This is one company which knows it pretty much has a monopoly chokehold on its customers … and is not afraid to squeeze when it feels it can get away with it. Did they ever lower price when exchange rate were in our favour? If not I think it might be time for the ACCC to start building a case as they can’t only claim currency fluctuations as an excuse to raise price if they never lower them for the same reason. I am essentially required to use Photoshop as I sometimes deal with complex advertising collateral, but I’ve had my eye on Pixelmator for quite some time. Not being into photo graffix as some are, I’m somewhat underinformed, but, truly, is there no alternative to PhotoShop? Surely the graffix market can’t be that small? I ask because–like so many who also voted with their feet and wallets–I no longer have Adobe PDF products on my box, except for those annoying registry entries that seem to come out of fresh air. A bit like Netscape entries. FWIW, I’m currently married to Foxit and Cute (which also happen to obey the PDF (read: Adobe) ruleset, unlike Adobe. Of course there are alternatives. But it’s like Microsoft Word with .docx files. Because when every single ad agency/design agency/in-house designer has Photoshop, they just expect you to be able to have the same suite and open the same files. It’s a reasonable expectation on their part. After all, they’re the client. So I pay for Photoshop, and I pay for Microsoft Office. Because the reality is, if you trade files as much as I do (constantly), then you need the industry standards. Of course, I do use other programs as well. For example, I do a lot of HTML editing in TextWrangler, and I use Skim to access some PDF files. But the default is Office and Creative Cloud etc. For the record, we use an enterprise option for Creative Cloud Suite. If you’re on OSX, then Affinity Photo and Affinity Designer are excellent, and only $50 ea, flat fee. Is it worth learning a new workflow for? I was going to mention the Affinity products too. Have used them since Beta, and think they are nice. Even on an 8 year old Mac. But, yes, you have to learn the different interface. There is a trial version you could test with (on their site). And, for Windows people, they are about to do Beta testing of Windows versions. Also for Mac people always use iTunes cards for software purchase as it’s an easy way to get a discount. Officeworks seem to have a permanent 20% off and others will go up to 30% on occasion. They work fine on the Mac app store. (e.g. I bought Logic Pro using this and looks like no problems getting the Affinity stuff this way). I have a diploma in graphics design that I finished in 2013. Of course I was required to use Adobe Photoshop and Adobe Indesign to pass the course. The last version that I bought was the full Adobe CS6 suite which I got as a student version with the discount. I decided then that I would not ever use Adobe software because of the possibilities of both lock in [ if you stop subscribing you can’t edit your Adobe file] and the price gouging in this article. So I bought Coreldraw which I have used since. That’s not for everyone because it only works on Windows. Unlike most graphics design people, I use Windows; most of us use a Mac. I also looked for possible alternatives in various ways. I use nuance pdf instead of Adobe acrobat. I use Coreldraw as the rough equivalent of Adobe indesign/illustrator. Photoshop is the hardest to find an equivalent for. I’ve tried Photoline. I’ve tried the free GIMP. I’ve tried the Corel photopaint that comes with Coreldraw. Overall they are good enough but I don’t do the complex photo work that someone like Renai probably does. By the way I have the same objections to Windows 10; it is certain to me that Microsoft will bait and switch a subscription for 10. So I am staying with Windows 7 for as long as I can and looking for Apple Mac or Linux alternatives in the future. To me the whole software scene has become nasty and sad. Adobe, you’re dreaming. From $480/year to $695/year (personal, all apps). I won’t be renewing, thats for sure. This is one of the benefits of moving customers from upfront software purchases to rental pricing – you can jack the price up on them at any time and they have little choice except to pay up if they want to keep accessing the software or their media assets. Tread carefully here. I tried GIMP back in ’12, W7HPx64 and a Canon LiDE 70 scanner. My PSP6.02 always gave me a choice between Thunking and WIA (which is weak and undernourished). GIMP can’t see the Thunker… Sad, because GIMP seemd to have real potential. That should (of course) read TWAIN, not thunk. Now that I’ve had my Caffeine. I find it ridiculous that I pay more for my personal PhotoShop subscription than my entire Office subscription which gives me 5 device installs. Adobe are the worst price gougers on the market. I will be cancelling my sub this month and use something else. The monthly price won’t change until the end of your year contract. Best to wait it out till the end of the year if you can. Usually Adobe are amongst the worst for thinking they can run roughshod over consumer law, it helps to show them they can’t here. Definitely Challenge them on this. Its Required by Aussie law. I think it was around the release of CS5.5 or CS6 I looked at upgrading all our licenses at the place I was working at. It was cheaper to fly to Vegas for the weekend and walk into a Best Buy than get our licenses from Adobe Australia. Funnily enough, prices NEVER go down when the A$ rises. I remember a few software companies, including Microsoft, pulling the same move back in the late 90’s when the A$ went as low as 40 something US cents – prices NEVER came down when the A$ went back up. A couple of years ago the A$ was almost US$1.10 and subs were still $10 a month. Complete and utter cash grab at the expense of Australian consumers again. I’m switching back to my old model of software usage. I’m in first year of subscription and was dragged screaming as I suspected this was going to happen – once locked in, subscription price will liberally increase. It’s actually more than the price. I’m using Photoshop less and less, and just a tiny fraction of it’s functionality. I use Lightroom – and it is getting slower. Not faster. Sorry Adobe, I’m not paying. I’m in the same boat – I use Creative Suite (mainly InDesign, Photoshop, Acrobat, Illustrator) and received the same email of an increase when my contract period ends (thankfully not till October). I’m pretty annoyed about it. I don’t need access to the other software they include, I hate the constant updating (we won’t talk about the lag issue I have currently due to one of their updates) and I never wanted to be on an expensive subscription. But, I need Photoshop (for the similar reasons to Renai), Acrobat and Illustrator. I could consider going back to Quark but, like everyone else, I switched to Adobe when Quark was charging ridiculous prices for licensing in Australia. Very unhappy. When Adobe launched Creative Cloud in 2012 it set the standard ‘all apps’ price at 49.99 USD/mth. Our dollar was hovering around parity and our local price was set at a comparable 49.99 AUD. A year later our dollar fell 10%, then another 15% over the following two years, and for the past six months the dollar has been down 30% from Creative Cloud’s launch. And yet our local price has remained at 49.99 AUD. What this means is for the past three years we have been paying significantly less than the 49.99 USD price that Americans have to pay. 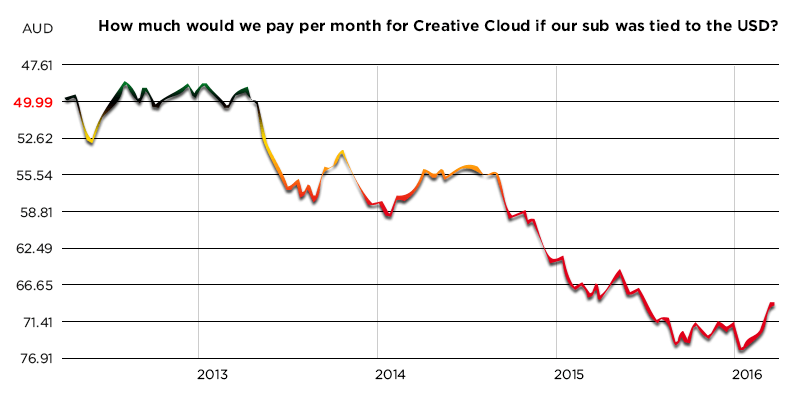 Even with the 14-16% increase, we’ll still pay less for Creative Cloud than the Americans. And the price increase won’t take effect until your current subscription term ends, up to a year from now. Where exactly are we getting stiffed in this? If our per-month was tied to the USD, we would have been paying an extra $17-26 per month for the past year. As for those complaining that their particular subscription price is nearly doubling, the upcoming price increase is only a small part of that. They have forgotten that their deeply discounted first (or three) year introductory subscription is coming to an end and the subscription renewal cost is reverting back to the standard rate, as was all clearly explained when they signed up a year or three ago. So they were going to be paying more anyway, just now there’s a 16% increase on it (and it’s still less than the American equivalent price). I’m glad I no longer need to fly over to San Francisco to buy boxes of Master Collection. And I love the extra apps, awesome features and improved workflows that Adobe regularly add to Creative Cloud. And I’m even happier that it’s cheaper (and still will be) than paying in USD. So “oh noes ur gouging me” it is not. Nobody likes a price increase, but the fact remains that if the Australian dollar rises and becomes somewhat stable again then Adobe should honour their excuse and adjust the subscription accordingly. And Muricans can’t understand why Australians constantly bypass geo blocks or simply pirate…..
Me too – even after the Aussie price increase, I’d still only be paying USD $43 / month for the whole thing! That is not as good as the Australian pricing currently, but it will still be a ~15% discount from the regular prices in the US.